Outside the “R” Ranch Bodega at Redondo Ave and West Adams the smell of grilled meat fills the air. 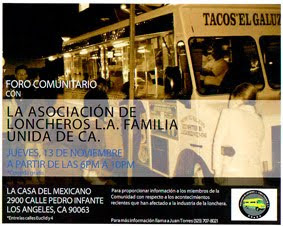 A taco wagon in the parking lot, a taco truck on the street, another parked on the northeast side of Redondo Ave. I got out my camera, notepad and prepared myself for taco consumption. 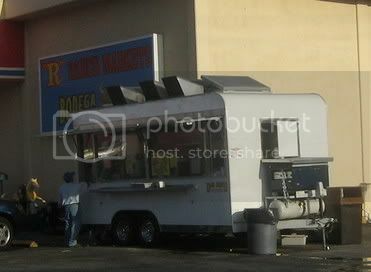 First up was Don Jose, the taco wagon in the parking lot. 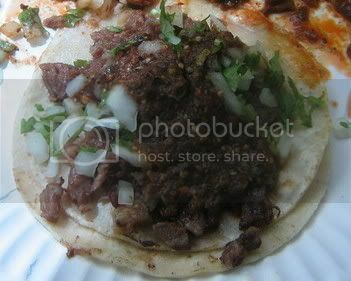 I decided to break out some español: Dos tacos, un de pastor y un de asada , con todo para aqui. If you don’t know any spanish do yourself a favor and learn those words and it will get you far in your own taco journey. That’s if you’re on a taco journey. Only a nutter would actually go on a taco journey and document it on the internets. Don Jose’s had something on the menu you don’t find at most taco trucks. Pupusas. Pupusas is a salvadorean dish. A thick corn tortilla stuffed with a cheese(quesillo) and a meat(usually chicharones). 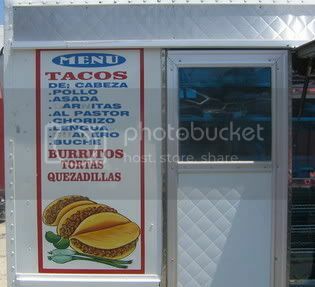 I wanted to order one but I figured it would fill me up and ruin my taco reporting. 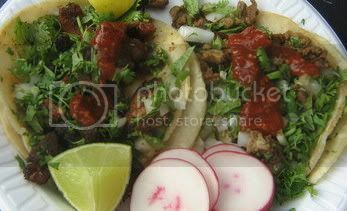 My tacos came with a cup of salsa roja, onions and cilantro. The tacos were bigger than your average but ultimately a letdown. The al pastor was overcooked and crunchy, dare I say burnt. The asada, flabby and flavorless. There was something to hold out hope for however. The al pastor that wasn’t burnt was very flavorful. I'll chalk this up to recieving a bad batch and give Don Jose another chance. So it was on to Leo’s, the truck parked on the street. I ordered the asada and al pastor to compare and also cabeza. 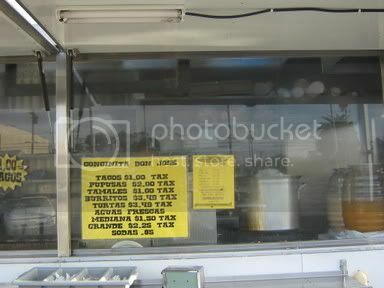 Leo’s is a truck where you pay after you eat your tacos (unless you get them to go). This gives the taco patron an opportunity to dos mas at any time and just add the total to your bill. 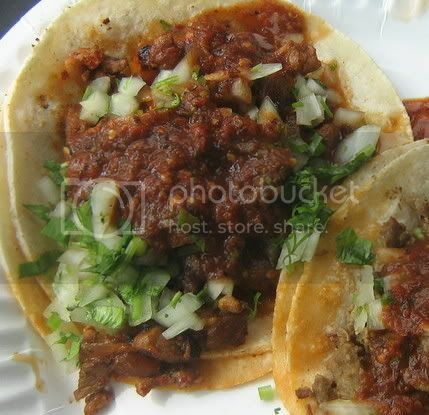 I probably would have dos mas’d if I hadn’t already had two tacos because boy was the al pastor tasty. Containers with salsa were set in the ice compartment. Verde and roja, even a pico de gallo. A reddish brown salsa with a smokey flavor that packed a wallop. It was a slow heat that built up with every bite. The asada was soft with a strong beefy aftertaste. It was the kind of taco that I may have to try again to understand what I liked about it. The cabeza didn’t win me over though,the beef was too fatty and the waxy texture a turn off. The al pastor stole the show.Soft heavily seasoned pork in a red saucy broth swimming with carmelized onions. 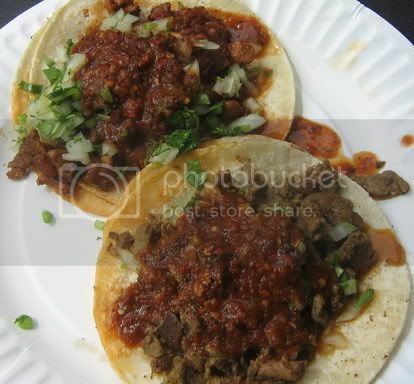 The dark salsa enchanced the salty pork flavor and the juice from the pork stained the soft well oiled tortillas. As I drove north up Redondo Ave I passed the taco truck in the empty dirt lot wanting to pull over but promising myself I’ll come back to this taco enclave not only to try the taco truck I missed but to give Don Jose another go. I always drool on my keyboard when I read your blog... I live in Bellflower and work in Downtown Long Beach, so it's a rare occasion that I even get to go to King Taco (the closest being in Lynwood). It's real difficult trying to get to any of the ones you blog on. Me gusta este blog, ca'. These places are kinda' near our house. I must give them a try. Always LOVE your photos and opinions, Bandini!